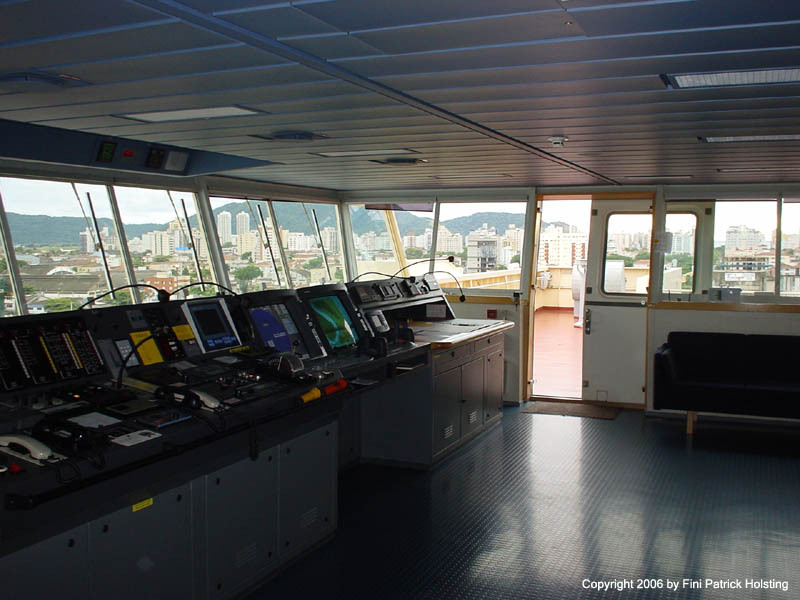 A view of the bridge during startup prior to departure from Santos, Brazil. Part of the bridge startup is performed in cooperation with the officer on engine watch, allowing us to fully test integrated systems, for instance the main engine control and steering gear (rudder). 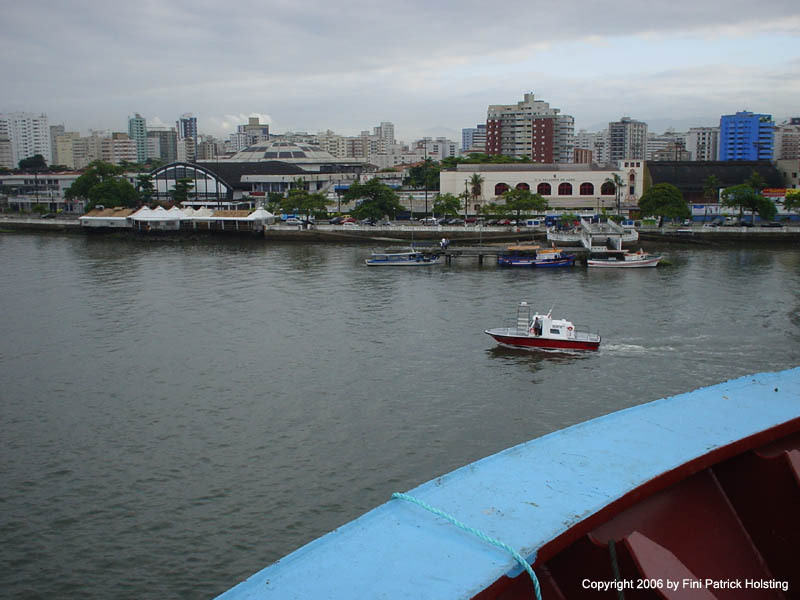 The port in Santos is located on a river, and here we're looking further up the river. 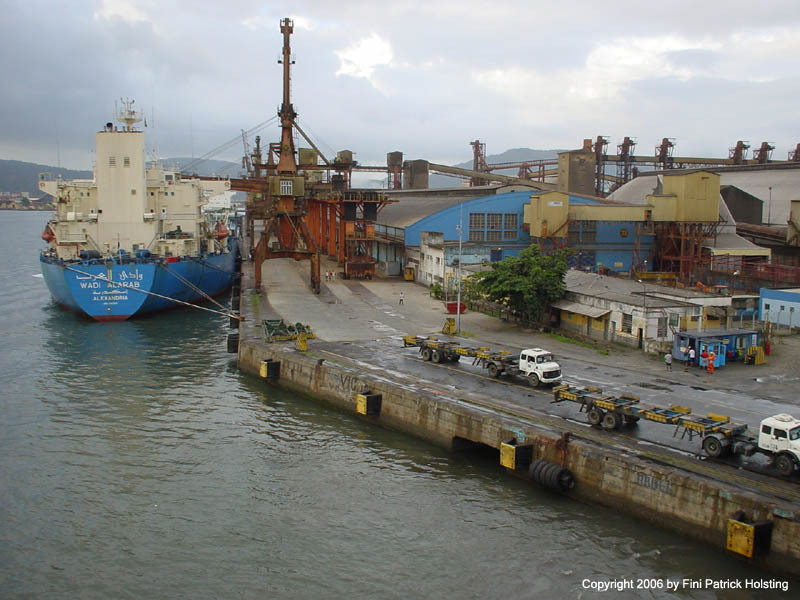 There are many piers, and ships constantly come and go in Santos, one of the biggest ports in Brazil. Loading the last few containers, the countdown to departure has begun. 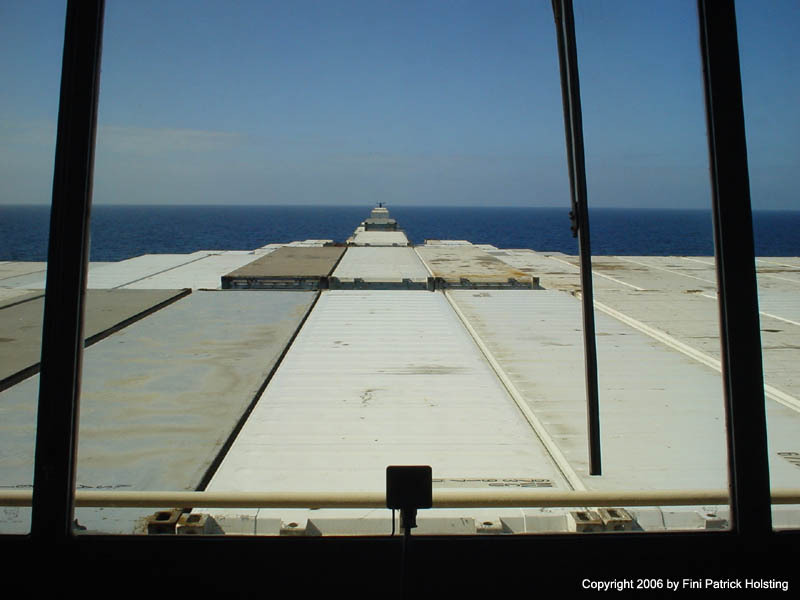 Container vessels often run a tight schedule! The forward navigation chart table, where the route for the next voyage is ready for the Captains approval. Prepairing routes was one of my responsibilities. Here I'm testing the main engine telegraph in cooperation with another officer. 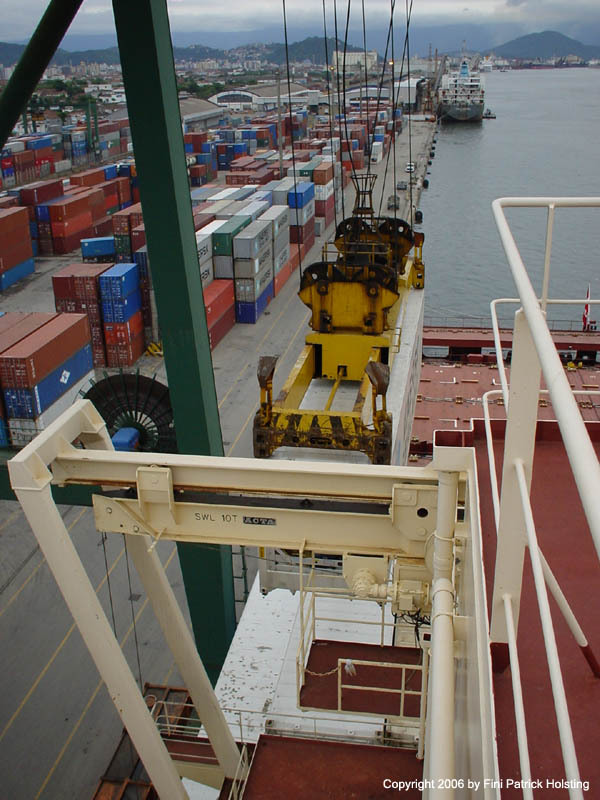 This check is important in order to avoid undesired and unexpected situations while manouvering inside the port. 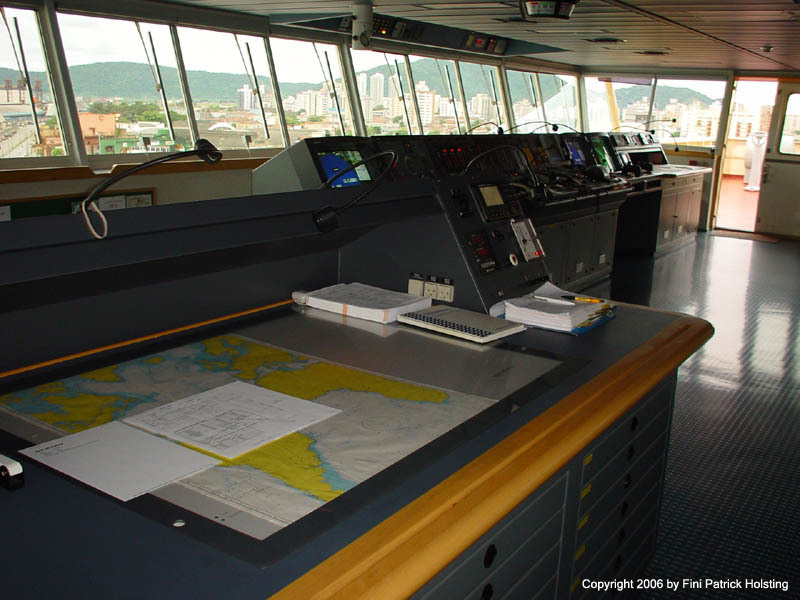 The aft chart table where route planning, chart and handbook correcting, administrative work etc. is carried out. A glance at the Costa Romantica, which we also saw in Buenos Aires. After she had passed, we were cleared for departure. 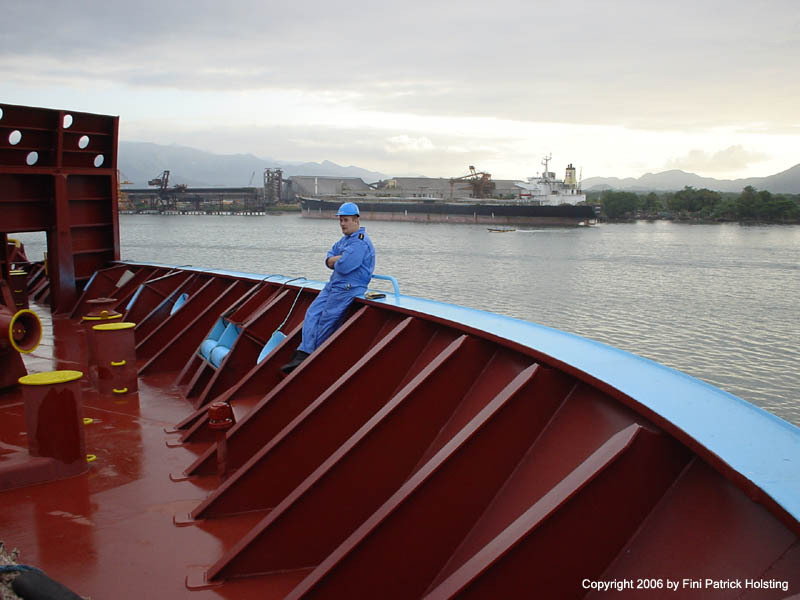 A view of events forward of the Lica Maersk, as we prepair to cast off and depart. 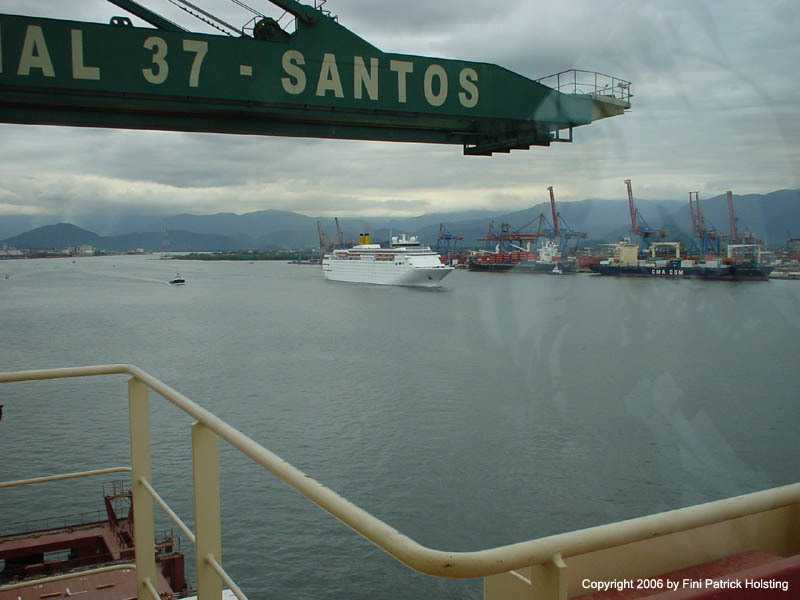 Santos is also a big player in the bulk cargo segment. Officer Cadet Martin, who followed me on my watch. No stranger to the sea, Martin will no doubt be a good and skilled officer. After casting off, we have time to enjoy the scenery as we make our way out the river past down town Santos. Lots of people and boats overlook our arrivals and departures here, which adds to the charm of the place. 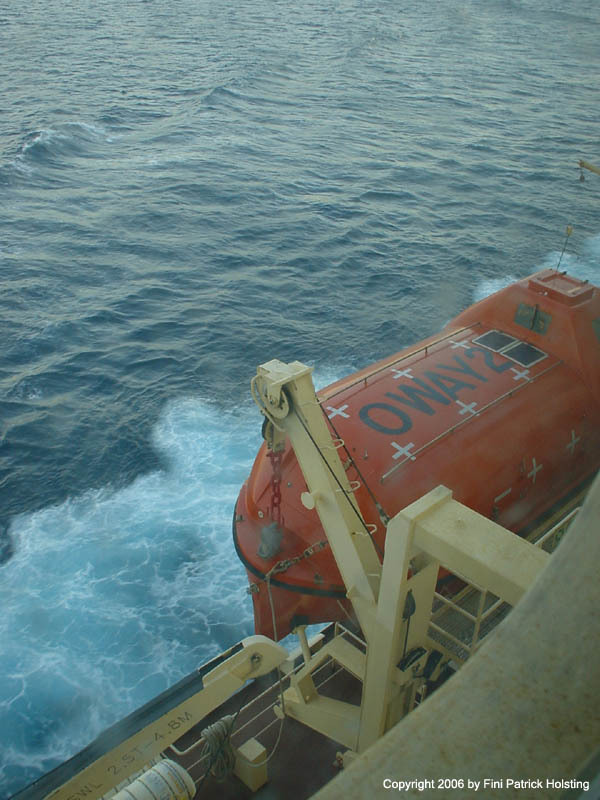 Having reached open sea, I shot this picture of the starboard life boat out of my cabin window. 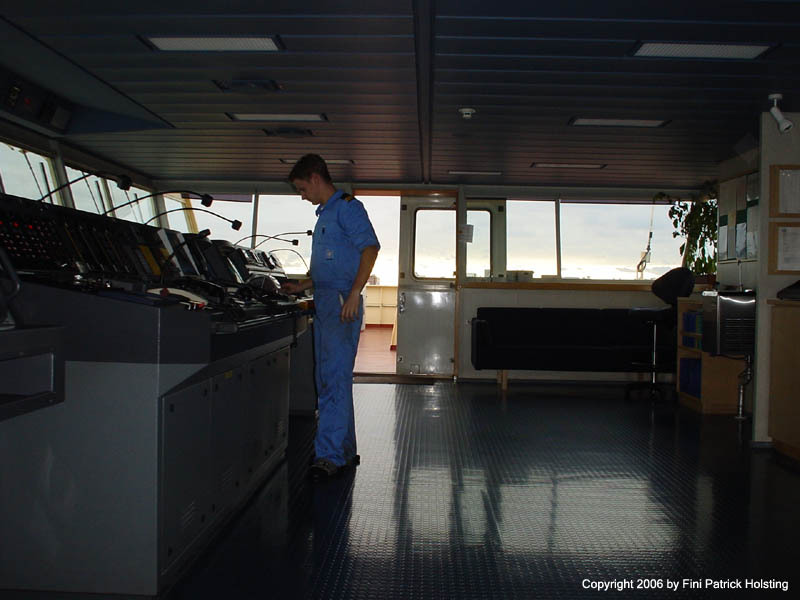 The OWAY2 painted on the boat is the call sign of Lica Maersk, used for identification during radio communications. Beside these are the two solar panels, which recharge the life boat engine batteries. Taking pilot outside Sepetiba, the chief officer is overlooking the operation as the pilot makes his way up the ladder. Note the heel of the ship, caused by the sharp starboard turn the ship was doing. 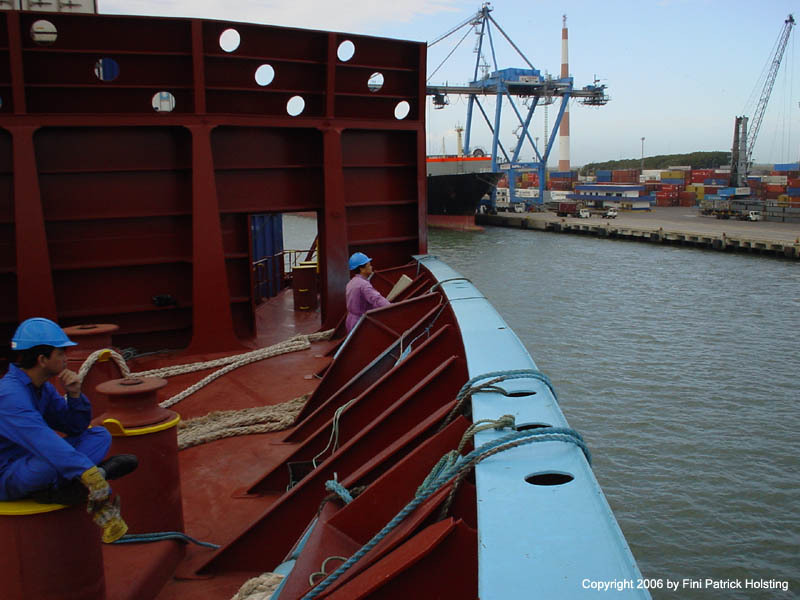 The pilot boat pulls away as we complete the turn and head further inside the bay for the Port of Sepetiba. Bay 48 aft of the accommodation filled with empty reefer containers, a common cargo from Europe to South America. The fulls ones go the other way. In the upper right corner the monorail crain, which is used for taking in stores and provision and landing garbage and large engine parts for overhaul or scrapping. 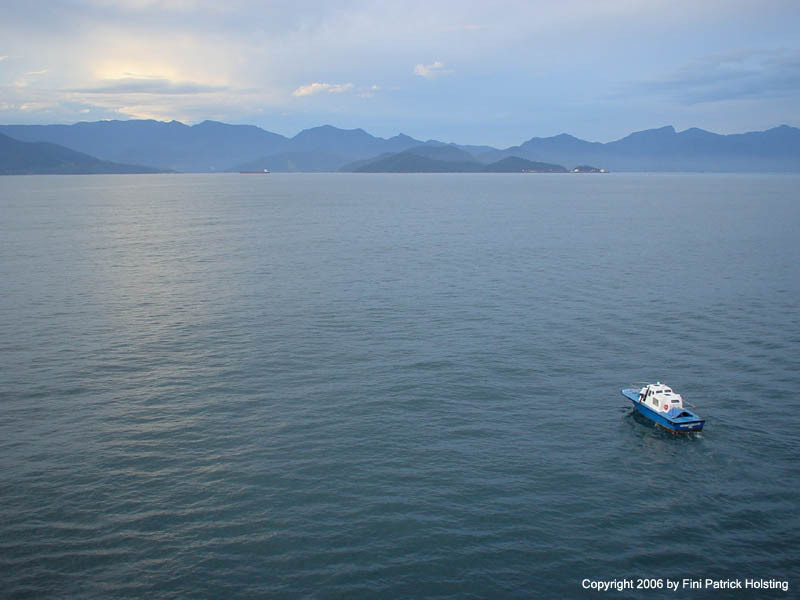 Arriving in Rio Grande, Brazil, the able seamen and I are waiting for the ship to get closer to the pier, so we can start the mooring operation. 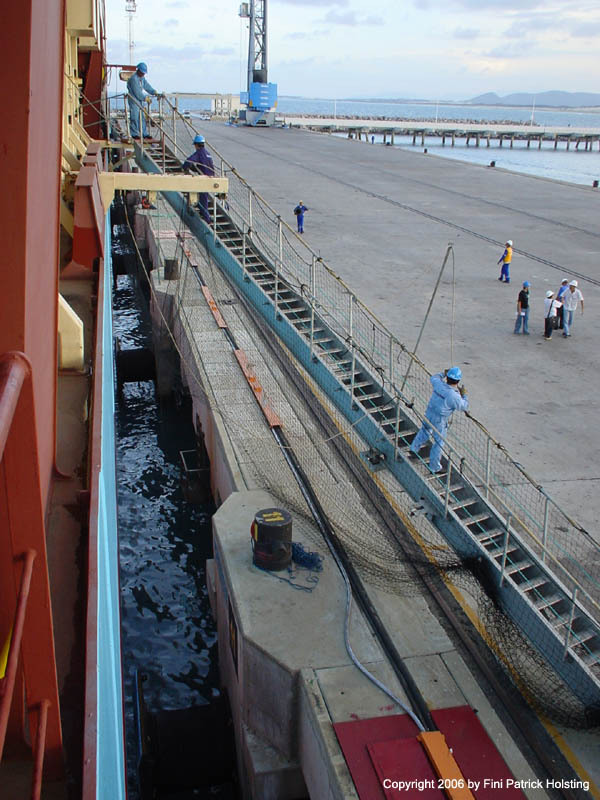 The able seamen rigging the starboard gangway after arrival in Pecem, Brazil. The net is for safety purposes. 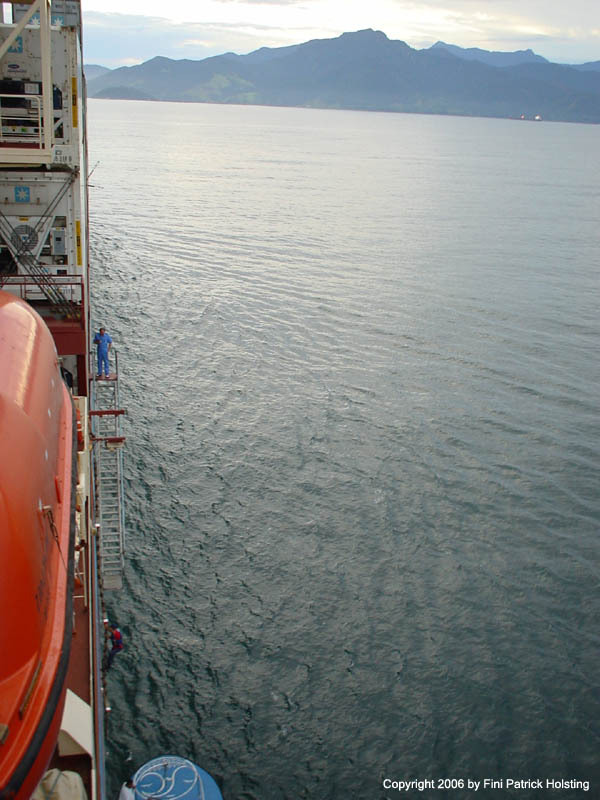 Rigging the gangway usually takes around 10 minutes. 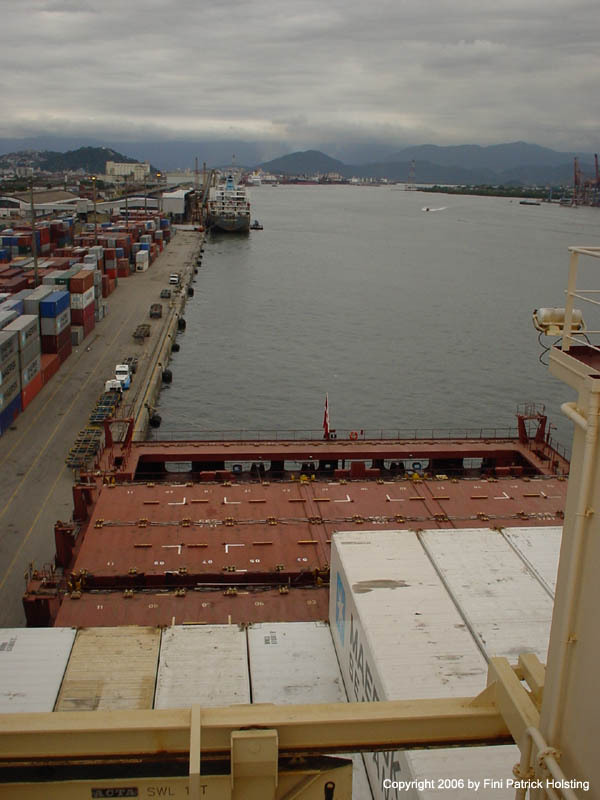 After loading a lot of reefer containers in Pecem, we headed northeast into the Atlantic Ocean bound for Algeciras, Spain. 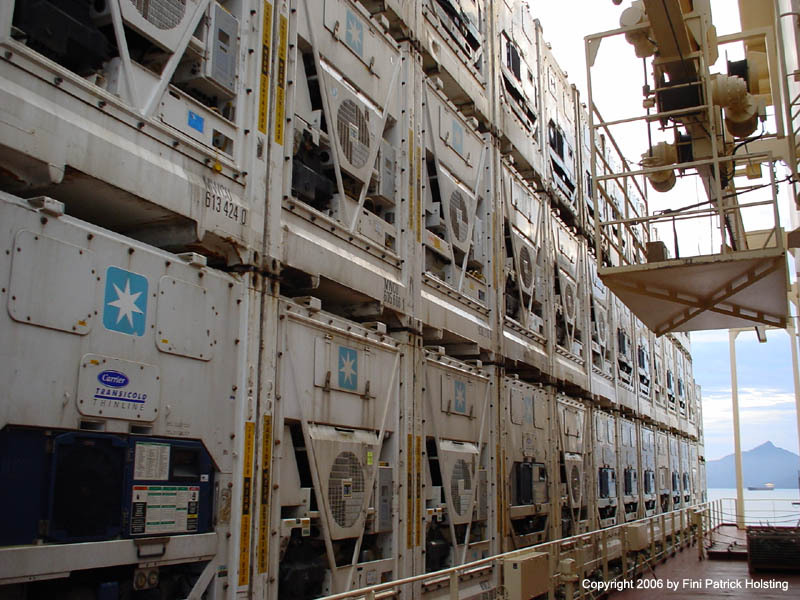 We were loaded to capacity with reefer containers carrying over 1100 units, which was common when going from South America to Europe. Shore leave in Vigo on the west coast of Spain. My friend Bardur from the ship is sitting next to the monument. 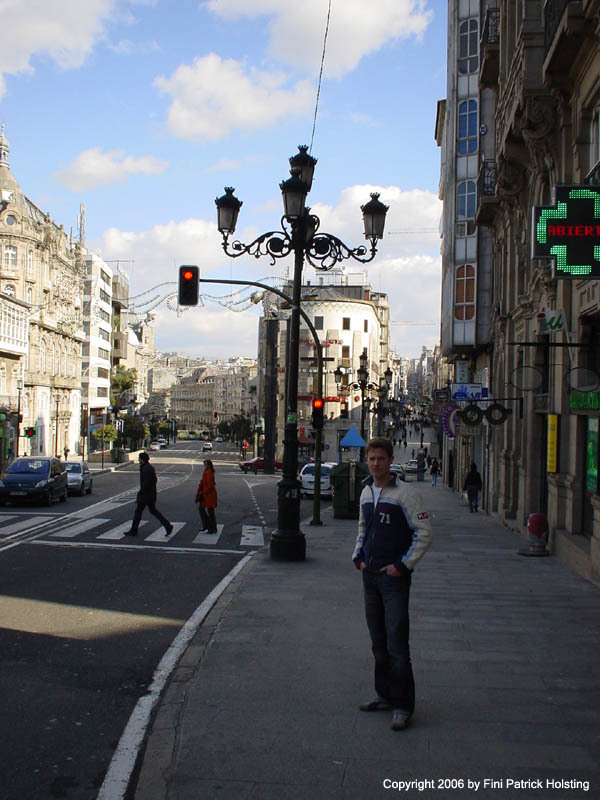 Vigo is a nice city with around 300,000 citizens, and is built on slopy mountains surrounding the port. Always a popular place to go ashore. 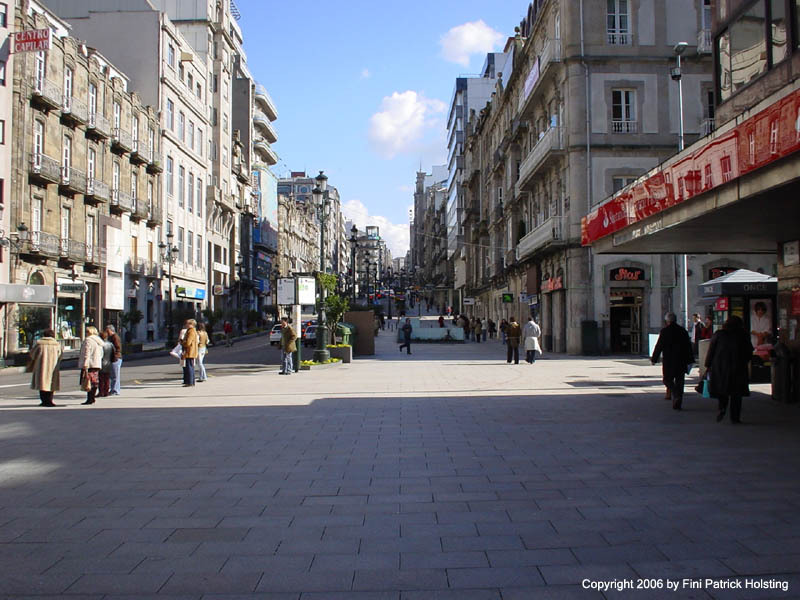 A view down one of Vigo's rich shopping streets. Here I'm standing a little further up the same street. 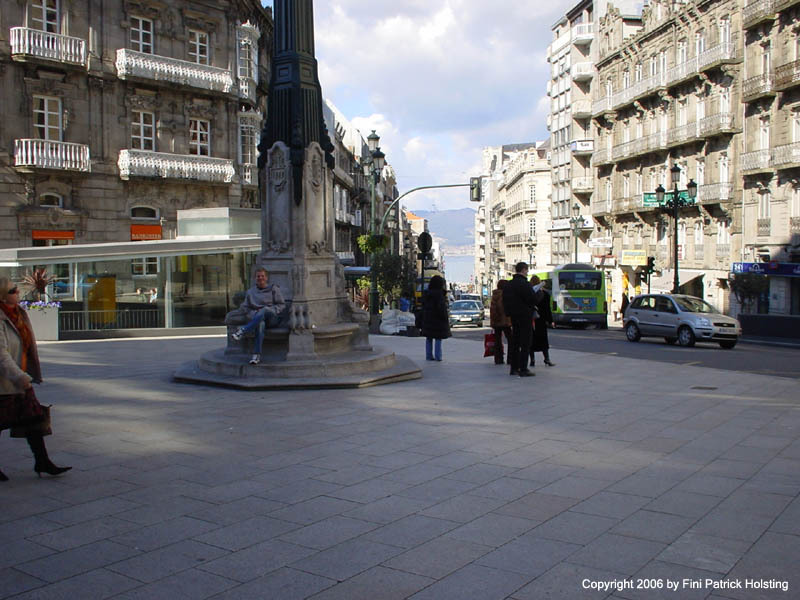 It's only a very short walk from the port to the city center which explains why Vigo is a popular port among sailors. 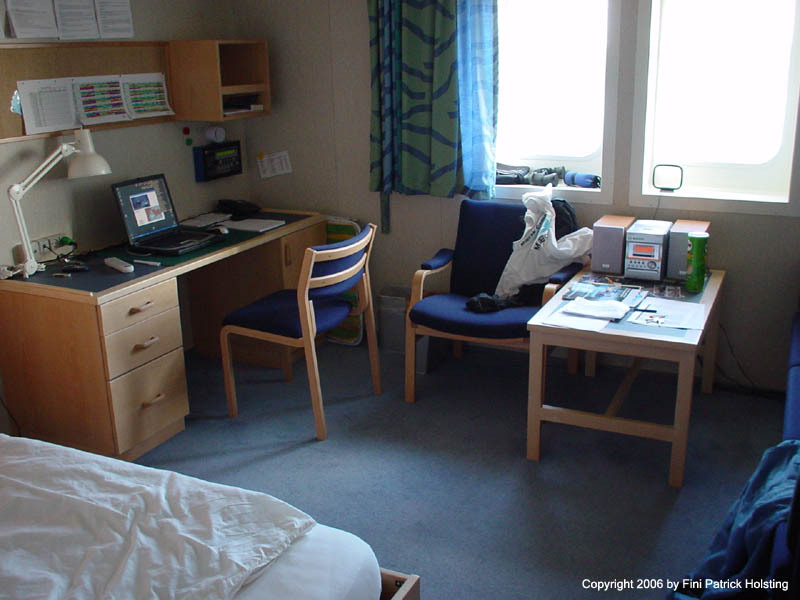 My cabin on board Lica Maersk, complete with bunk, desk, couch and stereo. 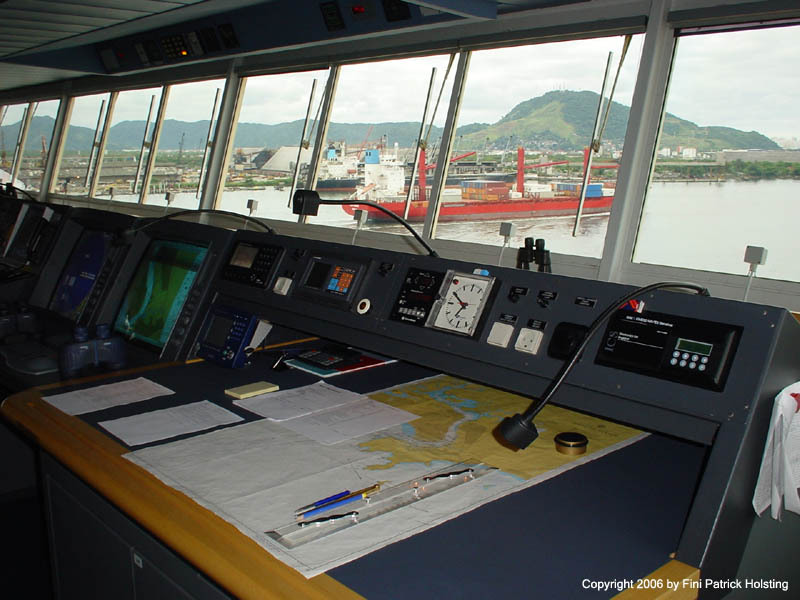 Above the right corner of the desk is the ship's alarm panel, which is used for relaying engine watch alarms during unmanned engine room periods (for instance nighttime). When the horn sounds watchkeeping engineer has three minutes to reach the engine control room and acknowledge the alarm.